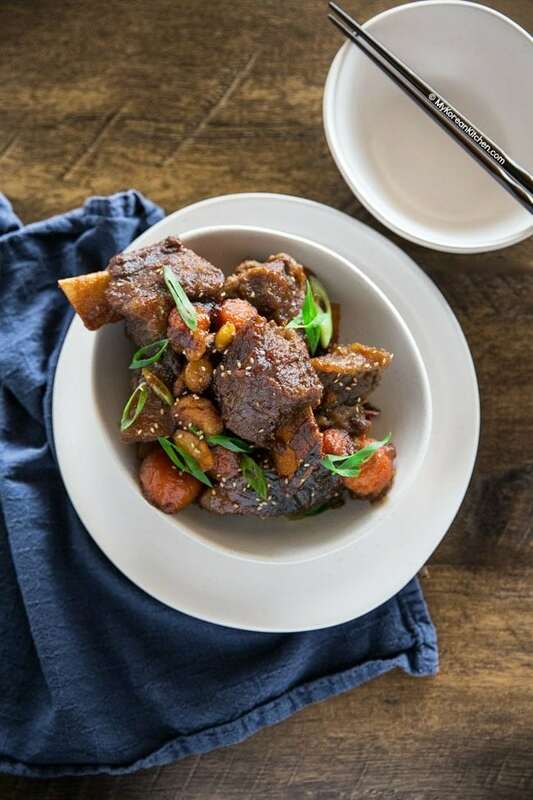 Tender, delicious and addictive Korean braised short ribs – Galbi Jjim recipe! Have you heard of Galbi Jjim / Kalbi Jjim / Galbijjim (갈비찜) before? 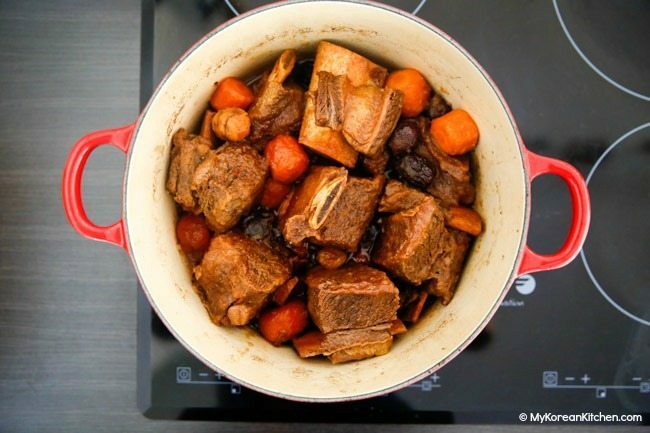 Korea has many braised recipes and galbi jjim is braised short ribs made with (often) beef short ribs. It is typically served during the festive holidays like Korean lunar new years’ day (seollal) and harvest festival days (chuseok) or at someone’s birthday or at a wedding reception. It is definitely one of the highlight dishes during these times. I would say the best thing about galbi jjim is super tender meat that is coated with sticky, salty, sweet, and nutty sauce. It’s hugely addictive! You can finish a bowl of rice with it in no time! The only downside is that its traditional cooking method is a little bit labor and time intensive. 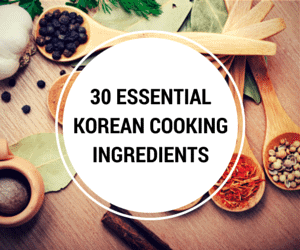 Though the ingredients are very available – you may not even need to visit a Korean grocer particularly if you’re not going to add any optional ingredients. For your information, you can get the right cut of short ribs from your local butcher too. Just show them the below photo and tell them that the size is about 4cm x 6cm (1.6 inch x 2.4 inch). That’s what I often do. 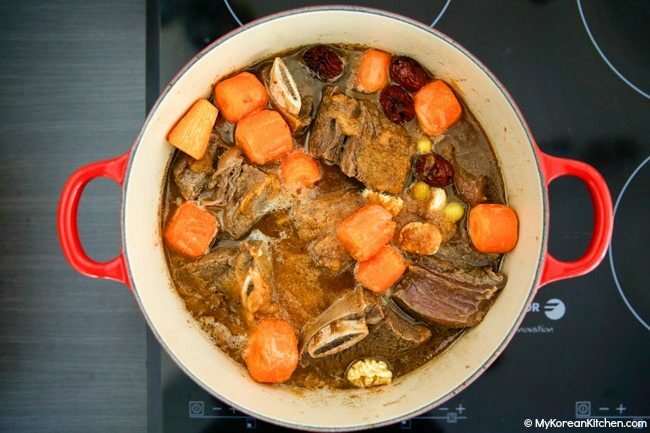 Nowadays, to save some cooking time, many Koreans make galbi jjim in a stove top pressure cooker, but I used my dutch oven for this recipe. While it may take 1 hour extra than pressure cooking, the result is outstanding! 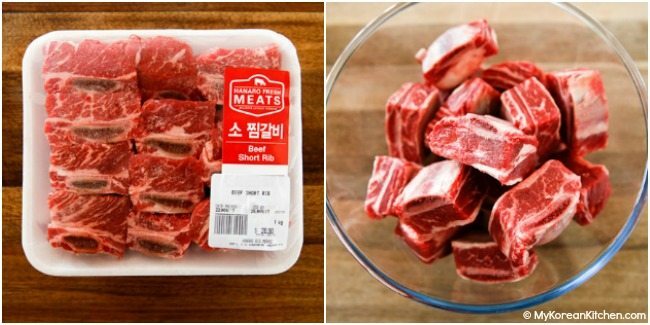 Some say that traditional cooking methods result in better tasting and better textured galbi jjim. But, I will let you decide. I also know some people make galbi jjim in a slow cooker too. I will share these versions as I test them out properly. Based on my relatively little slow cooking and pressure cooking experience, I would add no water or a lot less water if I’m using them. Anyway, stay tuned! 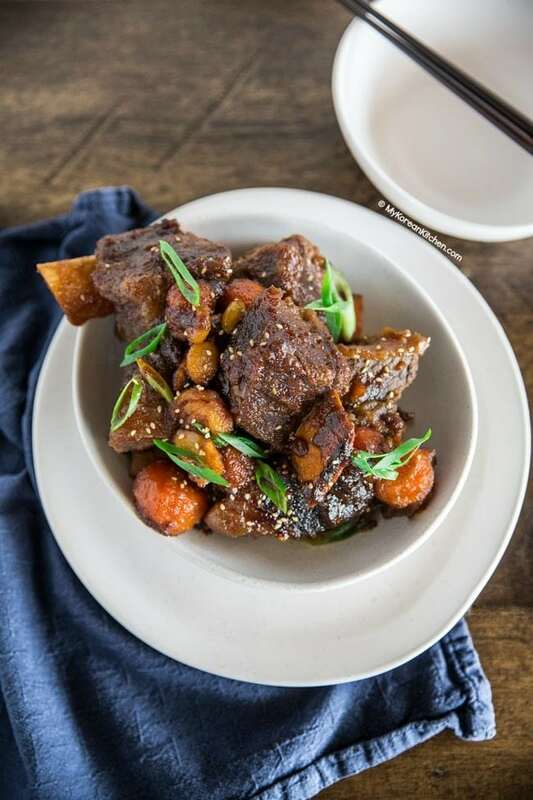 Update: If you have an instant pot or an electric pressure cooker, be sure to check out my instant pot Korean short rib recipe! This is just as good as the below recipe. Even better, it’s quicker and less work! 1. Soak the beef ribs in cold water for 10 to 20 mins. This is to draw out the red liquid (which looks like blood) from the meat. Change the water a few times during this time. 2. 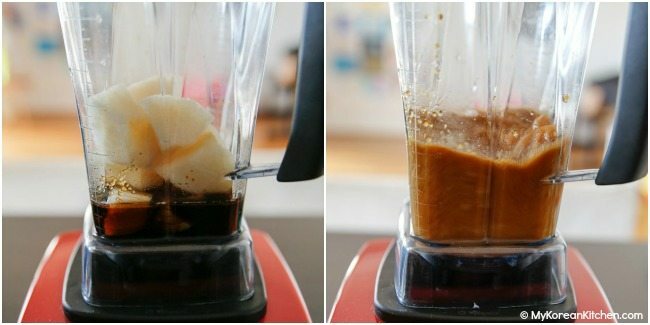 Blend the sauce ingredients in a mixer or food processor. Set it aside until needed. 3. In a large pot, in rolling boiling water, boil the ribs for 6 to 8 minutes over medium high heat. 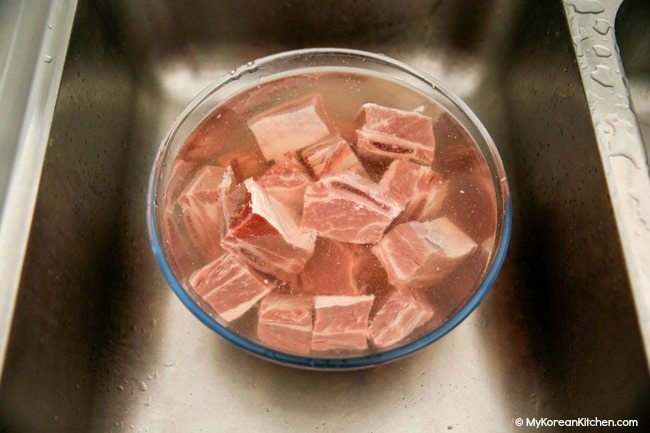 Drain the water and rinse the ribs in cold running water. Cut off any obvious excess fat from the ribs. 4. 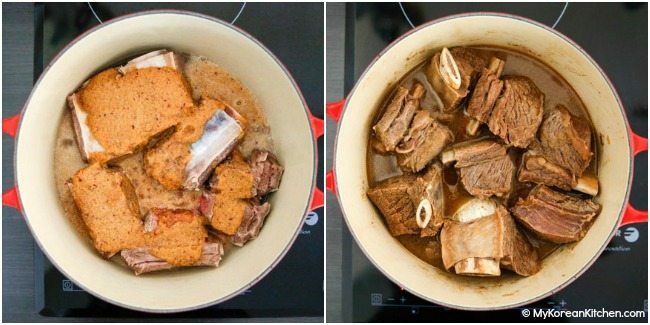 Place the ribs in a dutch oven and pour the water in (1 & 1/2 cups). Add 2/3 of the sauce. Boil them over medium heat for about 30 mins, covered. Stir gently and change the position of the ribs. Reduce the heat to medium low and continue to simmer for about 10 minutes, covered. 5. Add the remaining ingredients (carrots, jujube, gingko nuts, chestnuts and the remaining sauce) and continue to simmer it over medium low heat for about 20 mins, covered. 6. By now the ribs should be fully cooked, but they may not be tender. Continue to simmer them over medium low heat until your desired tenderness is achieved. (I normally simmer it for an additional 1 hour, covered.) Depending on how long you simmered it, you may still have a reasonable amount of sauce/liquid left in the pot. 7. 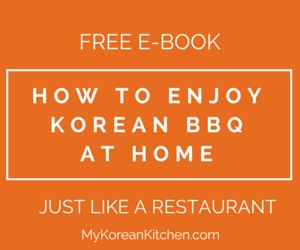 Serve galbi jjim hot with steamed rice and other Korean side dishes. To reheat, add 1/3 cup of water in a dutch oven and boil it for 5 to 7 mins over medium high heat, covered. 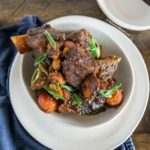 Super tender Korean braised beef short ribs - galbi jjim recipe! Soak the beef ribs in cold water for 10 to 20 mins. This is to draw out the red liquid (which looks like blood) from the meat. Change the water a few times during this time. Blend the sauce ingredients in a mixer or food processor. Set it aside until needed. In a large pot, in rolling boiling water, boil the ribs for 6 to 8 minutes over medium high heat. Drain the water and rinse the ribs in cold running water. Cut off any obvious excess fat from the ribs. Place the ribs in a dutch oven and pour the water in (1 & 1/2 cups). Add 2/3 of the sauce. Boil them over medium heat for about 30 mins, covered. Stir gently and change the position of the ribs. Reduce the heat to medium low and continue to simmer for about 10 minutes, covered. Add the remaining ingredients (carrots, jujube, gingko nuts, chestnuts and the remaining sauce) and continue to simmer it over medium low heat for about 20 mins, covered. By now the ribs should be fully cooked, but they may not be tender. 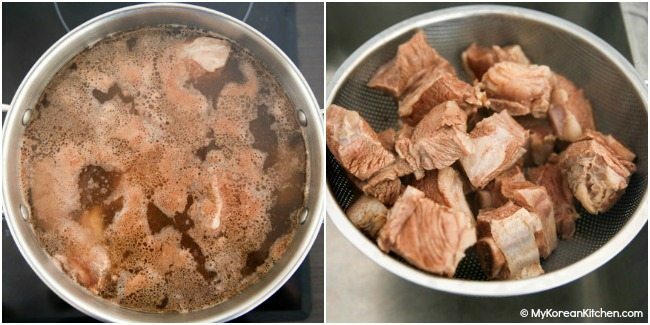 Continue to simmer them over medium low heat until your desired tenderness is achieved. (I normally simmer it for an additional 1 hour, covered.) Depending on how long you simmered it, you may still have a reasonable amount of sauce/liquid left in the pot. Serve galbi jjim hot with steamed rice and other Korean side dishes. To reheat, add 1/3 cup of water in a dutch oven and boil it for 5 to 7 mins over medium high heat, covered. Delicious. I made it stove top twice, did not have fruit or mirin, and it was still deelish! Thanks! With less meat, I made the total amount of sauce here. With the required 3 lbs of ribs, I made extra sauce, to go on the rice. Too good! I’m happy to hear that you enjoyed my recipe! Thanks for your feedback! I’m planning on making this for a party soon. Thanks for having an automatic serving size converter! So helpful! Can I add potatoes when all the other vegetables are added? Is there anything else I should serve besides rice? 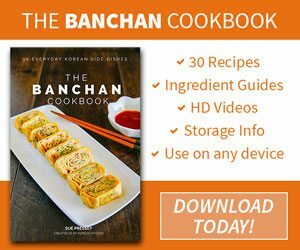 Banchan reccomendations? Yes, you can add some potatoes in there too. The sauce might thicken quicker. Any banchan will go well. It’s really up to you. Some kimchi and Korean egg rolls perhaps? You can get more ideas from here. https://mykoreankitchen.com/category/side-dishes-banchan/ Enjoy! I made these tonight and they were finger licking good. Definitely will make these again. Yum, yum, yum!! Thanks for sharing. We love Korean food. I just tried this recipe and it’s delicious! Thank you! I saw a video where the restaurant (in LA) added rice cake. They also served side dishes of different types of kimchee including: napa, daikon, chive. Your dish looks amazing! Wow, this recipe looks super delicious! It looks like something my grandmother used to make. Can’t wait to try it myself! This recipe looking colourful and yummy !!!! !Pictures look implausible! thanks for sharing this delicious one!!! Looks so juicy and delicious. Great recipe.